Nature’s Path Mmmaple Pecan Granola Bars + health benefits of Maple Syrup! Perfect time for a Nature’s Path review, seeing as my GIVEAWAY for granola bars, granola, a box of cereal AND reusable tote is going on AS WE SPEAK (or, as you READ, rather). 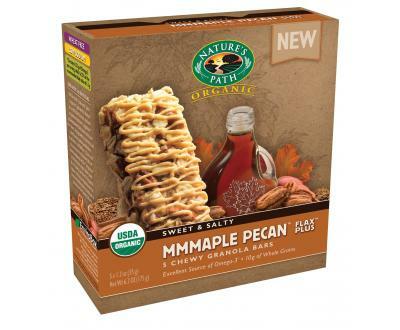 One of the granola bars a reader has a chance to win is the Mmmaple Pecan Flax Plus Granola Bar, which I was so kindly sent to review from Nature’s Path. These granola bars come in several flavors, in different groups. The Sweet & Salty fans can try the Peanut Buddy, Mmmaple Pecan and Peanut Choco flavors, those of you who like yogurt bars can try Lotta’ Apricotta and Berry Strawberry, trail mix fans can try Sunny Hemp and Pumpkin-N-Spice, and chocolate lovers can try Chococonut. On the down side, the bar is a little tiny (35 g), about the size of a Quaker Chewy granola bar, but a bit thicker. There also is 6 grams of fat and little protein for a bar that is 150 calories. 1 bar is 150 calories, 6 grams of fat, 22 carbohydrates, 2 grams of fiber and 2 grams of protein. we have a Guest Post! Sandy Harris at www.diabeticsnacks.org has provided us with some health benefits Maple Syrup has to offer, and how it can help a serious disease, Diabetes! substantially decrease the risk of diabetes. cancerous cells. Maple syrup has thirteen active antioxidant substances. pancreatic cells and enhances fat cells’ sensitivity to insulin. the annual meeting of the American Chemical Society in San Francisco. antiproliferative effect of ethyl acetate extracts. of Trolox equivalents (TE)/mg, respectively. was also used to establish the antioxidant activity of pure maple syrup. the orange juice value of 10.8 +/- 0.5 mumol of TE/mL. Thanks, Sandy! 🙂 Don’t we all love maple just a little bit more ?